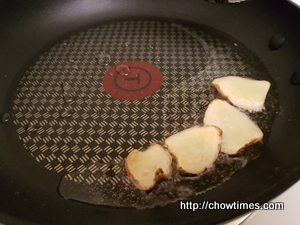 Heat oil in a frying pan, stir fry ginger until fragrant, remove ginger from pan. 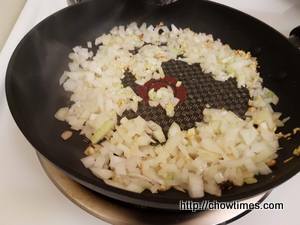 Stir fry the chopped garlic and onion until the onion is soften. 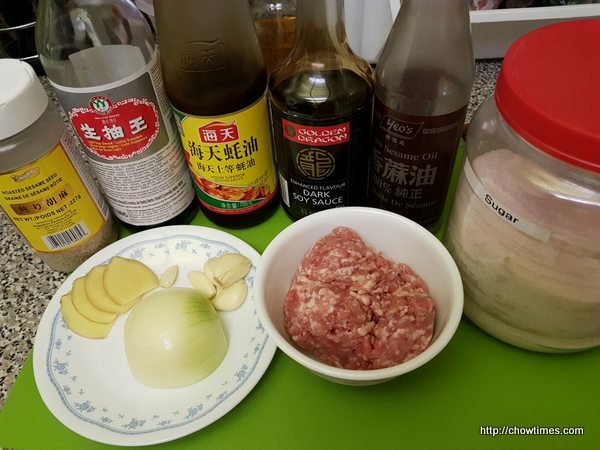 Add in ground pork. Break up the pork with a wooden spoon. 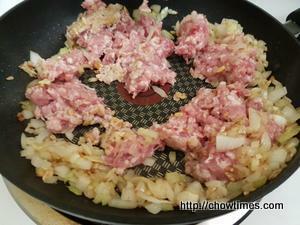 Add the seasoning ingredients and cook until the sauce is thicken. Let the filing cools down and ladle into a bowl, covered and place in the refrigerator for at least 30 minutes to set. 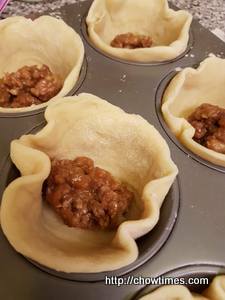 To prepare the water dough, place all purpose flour, sugar, baking soda and salt into a mixing bowl and stir to mix well. 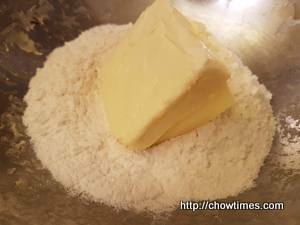 Add in butter and water and knead into a soft dough. 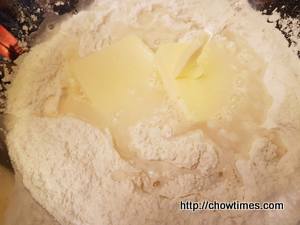 To prepare the oil dough, put the all purpose flour and butter into another mixing bowl. 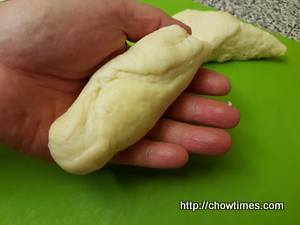 Mix into a dough (do not knead this dough). 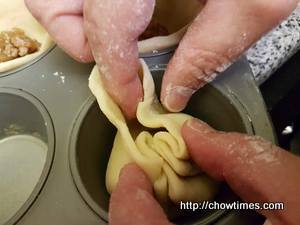 Place both the dough in separate bowls, covered with plastic wrap and leave them aside to rest for 30 minutes. 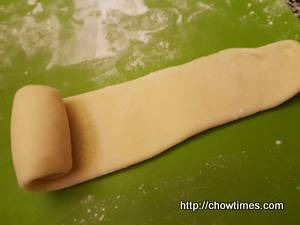 Divide each dough into 24 portions. 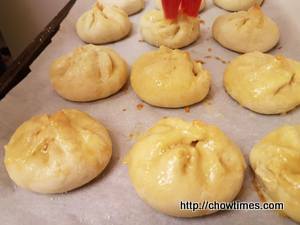 Ben commented that the dough looks like durian, :-). He simply misses fresh durian. 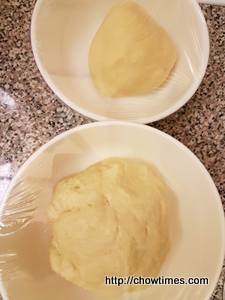 Flatten a water dough. 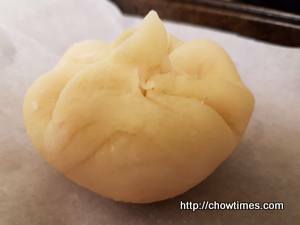 Wrap the oil dough in the water dough and roll into a ball. 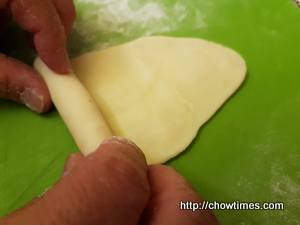 Roll the combined dough out into a long strip with a rolling pin. Roll the strip into a cigar shape. 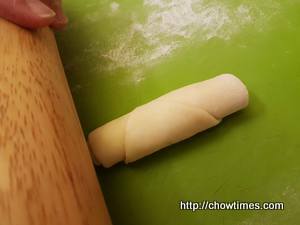 Place the cigar shaped dough vertically and roll up into a long rectangle strip. Roll up the long rectangle strip into a cylinder shape. 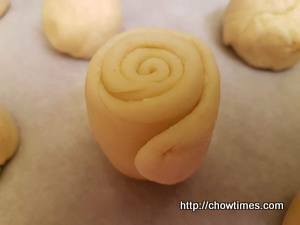 The roll up cylinder shape dough should looked like this. Repeat for the rest of the portions. 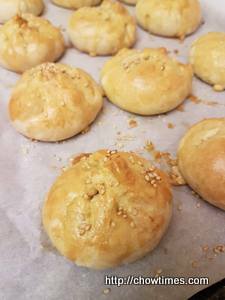 Let the cylinder dough rest for 20 minutes. 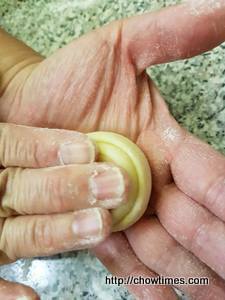 Flatten the cylinder dough and roll out into a round flat dough, about 4 inches in diameter. 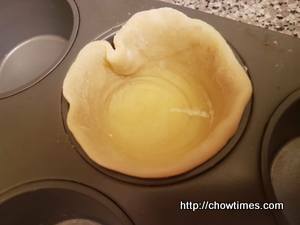 Line the flat dough in a muffin cup. Repeat with the rest of the portions. 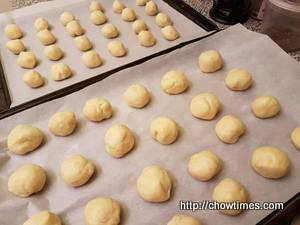 Divide the filings into 24 portions and fill the dough. 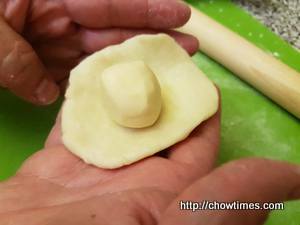 Crimp the dough like making Chinese steamed buns. The finished product should looked like this. 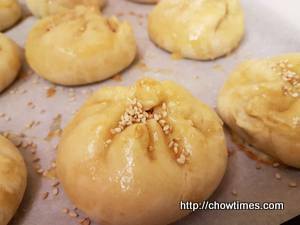 Brush the top of the Siew Bao with egg yolk wash.
Bake in a 350F preheated oven for 15 minutes. 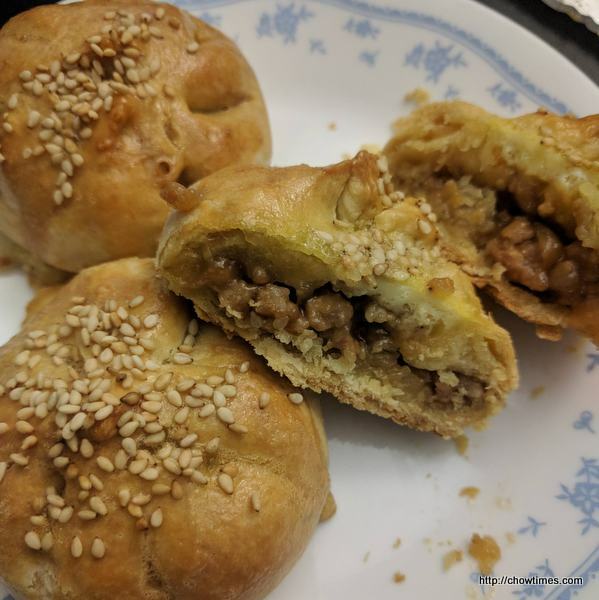 After 15 minutes, remove the Siew Bao from the oven. 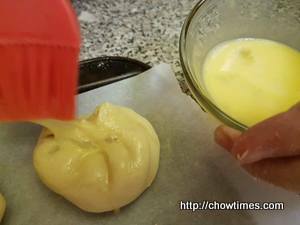 Brush with another layer of egg yolk. Bake for another 15 minutes in the 350F oven until golden brown. Here is the final product after 4 hours of labour but it’s worth it. 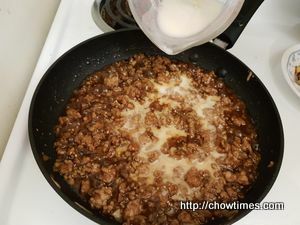 I recently learned this trick; if you want a darker colour to the egg wash, add a drop or two of soya sauce and stir. It will not affect the taste. Hi Chris, thank you for the tip.